These facts can save you thousands of dollars and make the homebuying process smoother. Applying for a mortgage is a complex process, and there are some things about mortgages that many people don't understand well, particularly those who have never bought a home before. With that in mind, here are seven facts about mortgages that could save you money and help your mortgage process go more smoothly. You may have heard that applying for new credit shows up on your credit report and can negatively affect your score -- and it's true. What you may not know is that there is a special provision built in to the FICO scoring formula that allows you to rate-shop a mortgage without worrying about its effect on your credit. For mortgages or auto loans, if all of your applications take place within a "normal shopping period," it will count as a single credit application for scoring purposes. The normal shopping period is either 14 or 45 days, depending on which version of the FICO model your lender is using, so to be safe, do all of your rate shopping within a two-week time frame. A small variation in interest rates can make a big difference over a 30-year mortgage, so it's worth taking the time to do this. It's generally best to compare mortgage rates because many people believe that the mortgage rate you see today will be around for another week, or even for a month. However, the mortgage market is a fluid one. Rates change throughout each day and can spike or drop unexpectedly at any time. Additionally, as I mentioned in the last point, different lenders can offer different rates and fees at the same time. This is a big reason lenders offer buyers the opportunity to "lock in" an interest rate at the time of the application or when getting pre-approved for a mortgage. A down payment equal to 20% of the home's selling price has been the mortgage industry standard for many years, but you don't need nearly that much, even in this post-financial-crisis world. For a conventional mortgage (one that's backed by Fannie Mae or Freddie Mac), you can get a loan with as little as 3% down. FHA mortgages can be had with 3.5% down. And if you qualify for a VA or USDA loan, available to veterans and rural homebuyers, respectively, you don't need any down payment at all. The caveat is that except for VA loans, you'll typically either have to pay mortgage insurance with your monthly payments or accept a significantly higher-than-average APR. However, buying a home still makes good financial sense for low-down-payment borrowers. As a personal example, I put 10% down on my current home and my payment is still significantly less than the cost of renting a comparable property. Self-employed borrowers can be tougher to qualify for a mortgage, and I can tell you firsthand that this is true. For one thing, many self-employed individuals (legally) deduct a large portion of their income, so the income figures on their tax return can be somewhat misleading. And income and employment history standards tend to be more rigid when it comes to the self-employed. To be perfectly clear, you can get a mortgage without great credit, if your income, employment, and other factors justify the loan. The minimum FICO score required for a conventional mortgage is 620, and you can obtain an FHA loan with a score in the 500s. However, good credit can save you thousands of dollars in interest over the term of the loan. Let's say you're in the market for a $250,000 30-year fixed-rate conventional mortgage. Based on today's average mortgage rates by credit score, here's how much you can expect to pay. Here's a must-know fact about getting a mortgage: Your lender will pull your credit again before the loan closes, usually a few days before. To be completely safe, don't do anything that will significantly change your credit score or debt levels. For example, if you obtain a new auto loan between the application credit pull and the pre-closing credit pull, it can affect your debt-to-income ratio and cause the loan to get sent back to underwriting. Or, applying for a new credit card could lower your credit score by enough that you won't qualify for your interest rate anymore. 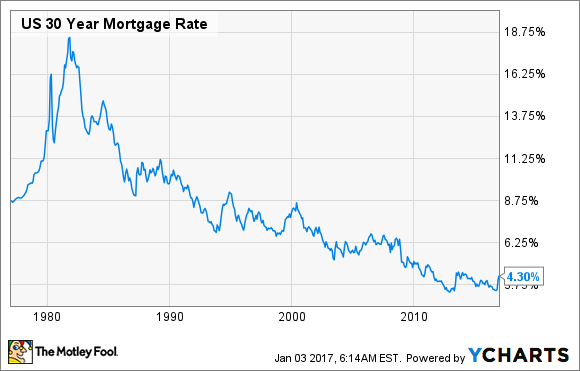 When my parents financed my childhood home in the spring of 1982, their 30-year mortgage came with an interest rate of more than 17%. They didn't have bad credit or anything -- that's just what mortgages cost at that time. In fact, rates had actually come down a bit when they bought. Average 30-year mortgage rates had previously hit a record high of 18.45% in October 1981. Hopefully, mortgage rates won't climb that high anytime soon, but the point is that even though rates bottomed at about 3.3% in November 2012 and have started to rise, they are still extremely low in a historical sense. Look at how today's average 30-year mortgage rate of 4.3% compares with the past 40 years. With the Federal Reserve expected to enact several more rate hikes over the next few years, it's likely that mortgage rates will continue to climb. So if you've been on the fence about homeownership, now may be a good time to buy while borrowing is still cheap.